Citation: Robinson, J0hn M, Liu, Yu, Shelton, David P. “Development and Characterization of a Magneto-Optical Trap for Rubidium.” Nevada State Undergraduate Research Journal. V1:I1 Fall-2014. (2014). http://dx.doi.org/10.15629/6.7.8.7.5_1-1_F-2014_2. We developed a magneto-optical trap for laser cooling and trapping of rubidium atoms. The trapped atom cloud is characterized in terms of the population, volume and temperature. At a laser detuning of 24 MHz we achieve a temperature of 250 ± 20 uK, which is approaching the Doppler cooling limit of ~150 uK. The population is determined by collecting fluorescent light emitted by the trapped atoms over a small solid angle and then inferring the total fluorescence power. The volume of the atom cloud is measured by spatially resolved absorption imaging. By optimizing the laser detuning we can trap as many as 108 atoms at a number density of 1011 cm−3. At our largest trap population the trap temperature is 670 ± 60 uK, which is measured using the time-of-flight technique. The characterization of our magneto-optical trap agrees well with typical values obtained. The optimization of the magneto-optical trap will allow us to work toward storing light in the cold atoms where a high density is required. We present simple and robust methods for characterization using off-the-shelf components, making it attractive as a first step in a more developed experiment. The ability to cool and trap neutral atoms has been demonstrated for nearly three decades [1,2]. Raab et al. developed the first magneto-optical trap for sodium in 1987 . The field of ultracold atoms has come a long way since then, with the first dilute gas Bose-Einstein condensate demonstrated in 1995 . One of the most direct applications of ultracold atoms are atomic clocks, which are now reaching relative uncertainties on the order of 10−18 . 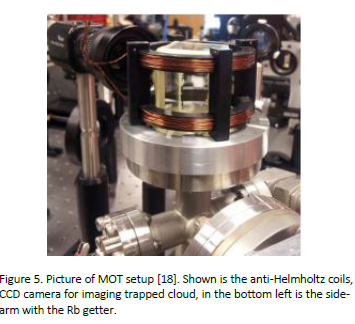 A common starting point for ultracold atom experiments is the magneto-optical trap (MOT). A MOT can achieve temperatures on the order of microkelvin with densities on the order of 1010 cm−3 . The eventual aim of the project is to store and retrieve light in both a vapor cell and the cold atoms using electromagnetically induced transparency [6,7]. It is known that storage of optical pulses depends on the optical depth of the storage medium . 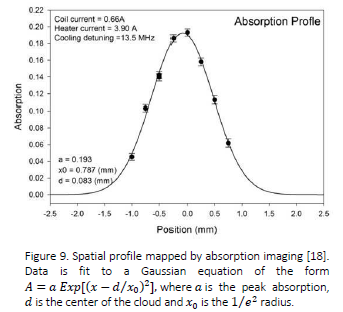 For a vapor cell the optical depth may be increased by raising the temperature of the cell. Previous studies using vapor cells as the storage medium show a maximum storage efficiency of 43% . Recently it was shown that EITbased light storage in an ultracold ensemble of rubidium atoms can achieve a storage efficiency of 78% . Our long-term goal is to compare vapor cells and ultracold atoms as light storage media. We report the first step of this project, the development and characterization of a magneto-optical trap. The work presented here may also be found in the senior thesis written by co-author Yu Liu . Rubidium (Rb) is an alkali metal with electronic dipole transitions in the near-infrared region (780 nm & 795 nm) and a room temperature vapor pressure on the order of 10-7 Torr. These two properties make it a convenient atom to study, as simple diode lasers can be used and there is no need for an oven to obtain atoms in the gas phase. The two naturally occurring isotopes of rubidium and their relative abundances are 85Rb (72.2%) and 87Rb (27.8%) . In this study we focus on the 87Rb isotope, though everything may equally be applied to the 85Rb isotope. as previously defined. We focus our attention on the D2 transition, which has a transition wavelength of ~780 nanometers. Similarly to the fine structure, F may only take values between |J − I| ≤ F ≤ |J + I| . The ground state of 87Rb has a nuclear spin I = 3⁄2, so it will be split into two levels (F = 1 and F = 2) . The excited state has J = 3⁄2, so the possible values for F are 0, 1, 2, and 3 . The energy level diagrams for the D2 transition is shown in Figure 1. Dipole allowed transitions correspond to F = ±1,0, and are shown by the solid arrows. The magnitudes of the hyperfine splitting’s are given on the left-hand side. Doppler broadening is the broadening of spectral features due to the thermal velocities of the atoms. The expression for the Doppler width is given by Fowles . By using the frequency for the D2 transition V0 = 384.23 THz, the speed of light c = 2.997 × 108⁄, the Doppler width is calculated to be approximately 511 MHz at room temperature (300 ). 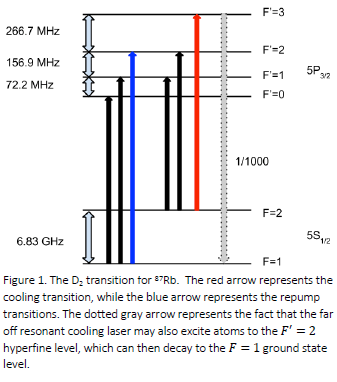 We can see that with this broadening one should be able to resolve the ground-state hyperfine splitting of 6.83 GHz, but the excited states will overlap and result in a single absorption peak. Laser cooling requires requencystabilized lasers relative to the hyperfine transitions of Figure 1. The method of saturated absorption spectroscopy is utilized to resolve the hyperfine spectrum of rubidium . 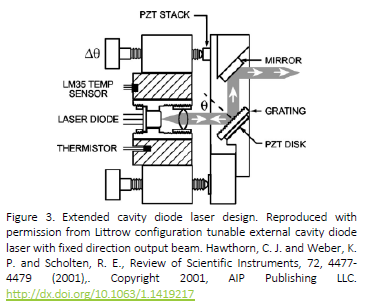 Laser cooling is a method of obtaining ensembles of atoms at the microKelvin scale. Cooling of atoms is achieved by slowing them down, which through the relationship , a smaller velocity corresponds to a lower temperature. Here m represents the mass of the 87Rb atom ( 1.44 × 10−25kg) , kB represents Boltzmann’s constant ( kB = 1.38 × 10−23J/K), v represents the velocity of the atom, and represents the temperature of the atoms. When an atom absorbs a photon with energy this energy is transferred to the atom, which results in the atom being in an excited state. Here ħ represents the reduced Planck’s constant ( ħ = 1.05 × 10^(−34)J ∙ S ) and represents the frequency of the laser. An atom will be more likely to absorb a photon when the photon’s energy is close to the atomic transition energy. This relationship is described by a Lorentzian function. If we consider a beam incident on an atom from a single direction the force is given by Adams, et al . where k represents the wave-vector of the light, I represents the intensity of the beam, represents the saturation intensity, represents the transition frequency, represents the frequency of the laser, represents the natural linewidth of the atomic transition, and v represents the velocity of the atom. In this excitation process the photon imparted some momentum on the atom, thus changing its velocity. The force on the atom is in the same direction as the original photon. Once in an excited state the atom will spontaneously decay, emit a photon, and recoil in a random direction, which represents a heating mechanism. 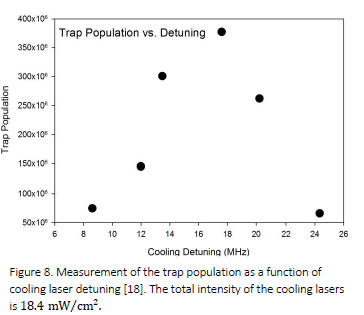 This spontaneous emission leads to the Doppler cooling limit, given by Lett, et al . For the F = 2 to F′ = 3 transition in rubidium this Doppler limit is approximately 150 uK. Note the dependence on the velocity in Equation 5. This forms the basis of Doppler cooling, first proposed by Hänsch and Schawlow . They proposed that if the laser beam is detuned below the resonant frequency, then any atom traveling toward the beam would be Doppler shifted into resonance. In this way the light can be in resonance with atoms travelling at some finite velocity. As the atoms are slowed down they are Doppler shifted out of resonance. By changing the atomic transition frequency or the frequency of the light the atoms may be shifted back into resonance. We address this by making use of a MOT, which shifts the atomic transition frequency by means of a magnetic field. The working principle of a MOT is most easily described in the one-dimensional case (see Figure 2a). The cooling laser is red-detuned from the B = 0 transition frequency, and a linear magnetic field is applied to the atoms. Through the Zeeman effect the energy levels of the different magnetic sublevels have been shifted according to the equation , where represents the secondary spin quantum number. By looking at Figure 2a we can see that by sending oppositely circular polarized light (indicated by and ) counterpropagating in a linear magnetic field, atoms on the right will preferentially absorb the photons because these photons are closer to being on resonance and thus be pushed toward the center. Similarly, atoms on the left will absorb the photons and be pushed toward the center. This can easily be extended to three-dimensions by having three sets of oppositely polarized light beams intersecting at the center of a magnetic field varying linearly in all directions. This may be seen in Figure 2b. We obtain the linearly varying magnetic field by making use of an anti-Helmholtz coil. An anti-Helmholtz coil is made up of two rings of wire with oppositely flowing current as depicted in Figure 2b. The overall effect of the MOT is a radiation force confining the atoms toward the center of the trap. The atomic transition used for cooling the atoms is the F = 2 to F′ = 3 transition (shown as a red arrow in Figure 1). This transition is chosen because there are no electric dipole allowed transitions to any hyperfine level other than F = 2. Atoms can leave the cooling cycle when the cooling laser excites some atoms into the F′ = 2 state. They can then decay to F = 1 and thus leave the cooling transition. For efficient laser cooling we need the atoms to stay in the F = 2 ground state so they can undergo absorption of the cooling beam. This requires us to make use of a ‘repump’ beam, which is tuned to the transition between F = 1 and F′ = 2 (refer to the blue arrow in Figure 1). The repump beam takes any atom which has fallen out of the cooling cycle back in. 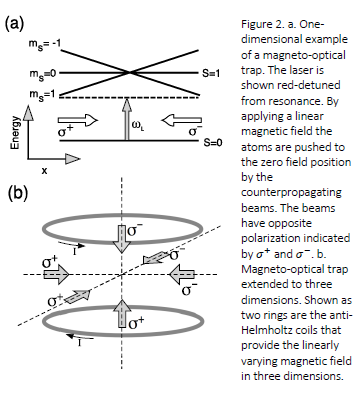 A magneto-optical trap (MOT) requires two lasers, each frequency stabilized to different atomic transitions (refer to red and blue arrows in Figure 1). We make use of external cavity diode lasers (ECDLs) in a Littrow configuration. Our ECDLs follow the same general design as Hawthorn et al. (see Figure 3). Linear polarized light from a single-longitudinal mode GaAlAs laser (free-running at = 785 , 70 injection current, ~30 mW beam power) is collimated by a convex lens with a focal length of 4 mm. The beam is incident on a blazed diffraction grating mounted on an adjustable mirror mount. Between the mirror mount set screw and the grating mount is a piezoelectric transducer allowing for precise control of the incident angle on the grating. The first order-diffracted beam provides tunable optical feedback while the zero order beam serves as the output. The beam spot is an ellipse with a width of 5mm and height of 2mm. A mirror compensates the angular deflection due to a change in the incident angle on the grating. An optical isolator is placed at the output of the cooling laser to reduce optical feedback. The optical isolator consists of a linear polarizer followed by a 45 degree Faraday rotator, and a second linear polarizer at 45 degrees to the first. This allows light to pass in the forward direction, thus reducing optical feedback to the laser diode with a measured extinction ratio of 10−3. The repump laser has no optical isolator, so in this case, care must be taken to not have reflections sent back to the laser in order to avoid unwanted optical feedback. 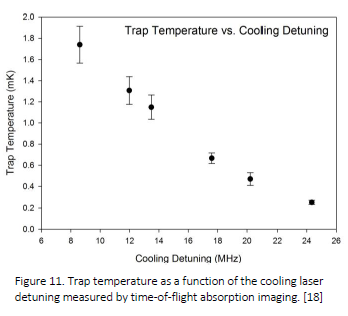 Laser cooling requires the laser frequency to be locked red-detuned from resonance by several times the natural linewidth of the cooling transition. We make use of saturated absorption spectroscopy of rubidium vapor atoms to lock the laser to the side of the atomic transition. Monitoring the absorption of a weak probe beam counter-propagating with a strong pump field allows the sub-Doppler features to be resolved in a multi-level system, such as rubidium. The presence of the strong pump field modifies the ground-state populations by saturation and optical pumping. The beams are in a counter propagating geometry, so the atoms will see both the pump and probe beam in resonance when the frequency is at the exact transition frequency within the natural line width. By looking at Figure 1 we expect to find three absorption peaks from each ground state in 87Rb. In addition to these there are crossover resonances, which arise because the Doppler profiles for each hyperfine transition overlap. 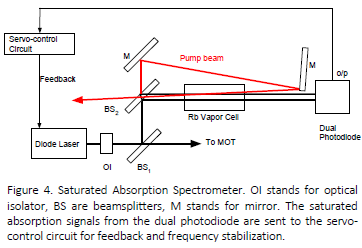 The optical setup for our saturated absorption spectrometer is depicted in Figure 4. The beam transmitted through BS1 is sent to the MOT while the reflected portion is utilized for frequency stabilization. The first reflection off of BS2 provides a reference Doppler broadened signal. Two irises are placed such that the second reflection (probe) traverses the center of each iris when they are closed down. The pump transmitted through the BS is sent nearly collinear to the probe beam by a pickoff mirror. The probe and reference beams are incident on a dual photodiode. A difference amplifier subtracts the two signals in order to obtain a pure saturated absorption spectrum. The principle of the frequency locking relies on the fact that a given voltage on the saturated absorption signal corresponds to a particular frequency. By means of a servo control circuit (for example see ), we can provide feedback through the voltage on the PZT and the diode current to keep the saturated absorption signal at a particular voltage, thus keeping the laser at a particular frequency. We implement the side-lock technique, where the feedback for the laser is obtained by taking the difference between a constant voltage and the saturated absorption dip. The constant voltage determines the zero crossing of the feedback, thus defining the locking point for the servo control circuit. We form the MOT at the center of a cell made of five pieces of glass sealed together with Torr seal (see Figure 5). The system is kept at approximately 10−8 Torr by an ion pump. Measuring the current through the ion pump monitors the pressure in the cell. Rb vapor is dispensed into the trapping region by passing current through a Rb getter. The heat produced by sending a current through a slab of Rb boils off Rb atoms that then fill the chamber. The current required to release Rb vapor is approximately 3.6 amperes. The rings for the anti-Helmholtz coil are made of plastic (Ertalyte). Before being split off into the three pairs of counterpropagating MOT beams the cooling laser intensity is 18.4 mW⁄cm2. The repump laser has ~10 mW of power and is sent through the trap in one direction. Electro-optic modulators (EOMs) are used to switch on and off the beams for the purpose of making time of flight measurements. They make use of the Pockels effect in acentric crystals and two aligned linear polarizers. At zero voltage they transmit the beam, but when the half-wave voltage is applied they rotate the polarization such that the lasers polarization is orthogonal to the output polarizer. The same logic pulse that triggers the power supplies controlling the EOM’s also controls the switch off of the magnetic field. Thus we can switch off the cooling beam, repump beam and the magnetic field in a synchronous fashion. 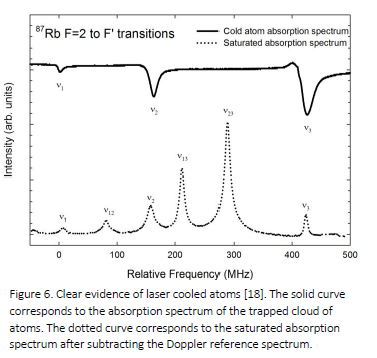 One of the most obvious signatures of laser cooled atoms should be the absence of Doppler broadening in the absorption spectrum. Using Equation 4, we can see that if the temperature were to be reduced by three orders of magnitude to 300 mK one should find a Doppler width of approximately 16 MHz. Thus all of the sub-Doppler features would be resolved without the need to perform saturated absorption spectroscopy. The absorption spectrum for the lasercooled atoms is shown in Figure 6. The solid curve corresponds to the signal observed by sending the probe beam through the cloud of atoms and recording the response on a photodiode. The dotted curve corresponds to the spectrum obtained from the saturated absorption spectrometer. If the atoms were still at room temperature the solid curve would be a broad spectrum. Instead we see the three atomic transitions from the F = 2 ground state. The observed line width of the = 2 to ′ = 3 transition is 15 MHz. This value is 9 MHz larger than the natural line width limited value of 6 MHz. We suspect this value is not from residual Doppler broadening, but instead primarily from Zeeman shift broadening and broadening due to laser fluctuations. The asymmetries of the absorption peaks suggest Zeeman shift effects are playing a significant role. The broadening contributions have not been accounted for quantitatively. Instead of using this absorption line width as a measure of the temperature we use a more reliable technique called time of flight imaging. We are interested in several parameters concerning the performance of our MOT. The first is the number of atoms in the trapped cloud. We determine this by measuring the fluorescence emitted from the trap. This measurement is depicted in Figure 7 by the orange light rays. We image the cloud of atoms onto a photodiode with a lens (f=7.5 cm, D=6.0 cm), where D represents the diameter of the lens (see Figure 7). We investigated the number of atoms as a function of laser detuning. Using Equation 10 we mapped the measured photocurrent to the number of atoms. The results are plotted in Figure 8. One can see that the trap population reaches a maximum of 3.7 × 108 atoms at a detuning of around 18 MHz. Here a is defined as the peak absorption, d is the center of the atom cloud and x0 is the 1⁄e^2 radius of the cloud. The fit parameters are shown in . The radius of the cloud was determined to be 0.787 mm. A trap diameter of ~1.6 mm is consistent with the size estimated by viewing the cloud using a CCD camera. It should be noted that the MOT beams heavily saturate the absorption of the probe beam. The magnetic field also perturbs the interaction through Zeeman shifts. Thus we cannot extract a reliable optical depth from this measurement. Various methods of measuring the temperature of a trapped cloud of atoms have been previously investigated . Of them, we chose to use the time-offlight (TOF) technique, as it is the most direct. The physical idea of the measurement is shown in Figure 10a. The probe beam is aligned below the cloud of atoms at some distance, d. At t = 0 we shut off the cooling and repump beams and the magnetic field. The atoms will then expand ballistically and after some time will intersect the probe beam. found that we got the best signal from the absorption measurements. 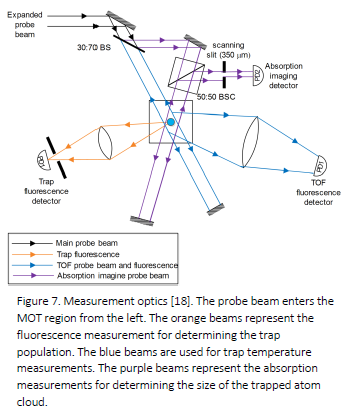 The optical setup for these measurements correspond to the purple beams in Figure 7 (with the scanning slit removed). 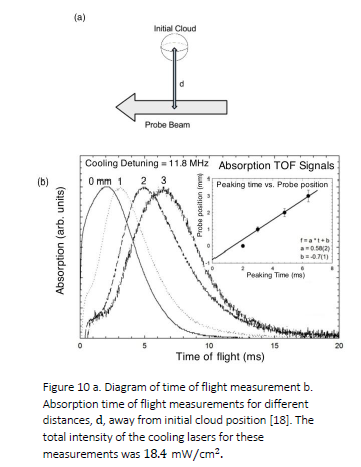 The TOF absorption data obtained with a laser detuning of 11.8 MHz is shown in Figure 10b. With increasing distance between the probe and the cloud of atoms we can see the peak of the absorption moves to later times. The peak time is plotted against the distance in the inset of Figure b. We fit a linear function to this data to extract the most probable velocity for the cloud of atoms. Assuming a Maxwellian distribution we may use in order to determine the temperature. The linear fit gave a velocity of 0.58 ± 0.02 m⁄s. Given this most probable velocity the temperature of the atom cloud comes out to be 1.8 ± 0.1mK. achieve a temperature of 250 ± 20 uk. The temperature of the atom cloud when we have the maximum number of trapped atoms is 670 ± 60 uK. We have constructed and characterized a magneto-optical trap for rubidium atoms. Our trapped atoms have a minimum temperature of 250 ± 20 at a laser detuning of ~24 MHz. With the laser detuning at 18 MHz we trap up to 108 atoms at a number density of 1011cm−3. At this detuning we measure a temperature of 670 ± 60 . These parameters for our MOT are reasonable when compared to the literature. In order to store and retrieve light in both a vapor cell and the cold atoms using EIT control and knowledge of the optical depth is required. Measuring the optical depth will require pulse sequencing to control both MOT beams and the probe beam. We will also implement a CCD camera to measure size, optical depth and temperature, making the characterization process more efficient. We present simple and robust methods for characterization using off-the-shelf components. In this way these measurements allow for a simple yet accurate characterization, allowing for more complicated experiments to be pursued in the future. We acknowledge Bill O’Donnell for his assistance and guidance in the UNLV electronics shop. We also acknowledge Paul Ellison for his assistance and guidance in the UNLV machine shop.